Millionaire Loren Coburn’s Relatives Owned the Coburn Trolley Co.
One of Loren Coburn’s brothers owned the Trolley Track Mfg Co. Note: Below is promotional material for Coburn Trolley Track Manufacturing Co., Holyoke, Massachusetts. Loren Coburn was visited in Pescadero by the relatives who had a financial interest in the business. “Efficient management coupled with inventive genius have developed under the name of the Coburn Trolley Track Manufacturing Company, a permanent and successful business of no small magnitude. “This Company was organized in February, 1888, with a capitol stock of $10,000, which was some years later increased to $150,000. “The foundation of this business was the invention of a special form of enclosed track for sliding doors by Mr. Lemuel Coburn. The manufacturing of same began in the basement of the old Whitcomb building on the first level canal in a room about 50×30. “The superiority of the special form of track over other tracks used for similar purposes was soon demonstrated, and through the foresight and inventive genius of Mr. Lemuel Coburn in constantly finding new uses for their product, the Company was soon compelled to seek additional capital and also larger quarters, and in December, 1891, moved into the quarters formerly occupied by the Deane Steam Pump Company on Bigelow Street. “The development of the various lines here began in real earnest, and with the opening up of agencies in practically every city in the United States, together with branch offices in Boston, New York, Philadelphia, Cincinnati, Chicago, and also in Manchester, England, the business was given such an impetus that it became necessary to obtain still larger quarters, with the ultimate result of the erection of the Company’s own plant at Williamsett, directly opposite the river from Holyoke. This plant at the present time covers something over two acres of ground and is equipped with such machinery as is necessary to take care of the constantly increasing business. “The Company moved into its present buildings in the fall of 1900, and with the increased facilities thus available was able still further to develop the scope and usefulness of its product, and extend the market for same to practically every civilized nation. “At the present time the varied lines manufactured by them are such as to create a steadily increasing business each year, and no such thing as a dull season. “It is an interesting fact of no small importance in illustrating the value of the original patent granted to Mr. Lemuel Coburn that in spite of of many radical changes and improvements made in various ways to meet new conditions and also increasing competition, the same form of track has always been adhered to, although new sizes have been added from time to time, as was first made in the Company’s original quarters. It is also true that no form of track was ever so closely imitated. Now that the patents have expired, many firms in the country, England and also France, heretofore making imitations have discarded same for the Coburn form of track. “One of the first departures made in finding new uses for the enclosed track was its applications to rolling ladders for the purpose of reaching or storing goods on high shelving. This meant to the storekeeper in many instances, then as now, increased space and better and more rapid handling of the goods, and although originally designed for stores new uses are constantly being found for them, not only in this country but others, shipments having found their way to Cape Town, Australia and the Orient. “Sliding door hardware has, and probably always will, offer the greatest chance for variation. Under this heading is included all sort and kinds of doors, from a small closet door weighing a few pounds to doors weighing several tons. Also under this heading come Automatic fire resisting doors which require special and carefully constructed hardware, made to comply with the insurance laws. The Coburn Company now has an enviable reputation for quality of their output, and as an evidence of this the Mexican government has recently, through their agents, placed a large order with them for doors. 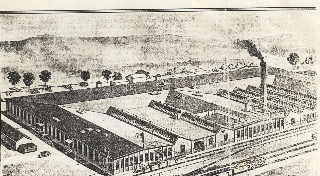 “Conveying materials of any kind have always been to a great extent left for “BULL STRENGTH” and the “GANG” of ordinary laborers, and it was early evident that here, too, was a field for “Coburn Products.” As soon as facilities permitted, they started the manufacturing of suitable track, of the same design, for use in foundries, machine shops and other manufacturing plants, and within a short time so demonstrated the usefulness of the idea that they received a contract for equipping one of the largest foundries in Massachusetts with their “SYSTEM.” This branch of the business has unlimited possibilities along the lines of modern business development and conservation of energy wherein the necessity for the moving of raw or unfinished material occurs, and the problems presented for solution require engineering ability and long experience to determine the proper method of procedure. This entry was posted in Coburn Troley Co., Lemuel Coburn and tagged Coburn Trolley Mfg Co., Lemuel Coburn. Bookmark the permalink.